WikiLeaks cables suggest serious shortcomings in Cambodia’s willingness to abide by human rights treaties – and China’s continuing influence in the country. Cambodian authorities assured the United States’ ambassador to the country that it would abide by international refugee protocols, just two days before it broke its obligations and deported a group of Uighur asylum seekers to an uncertain future in China, according to documents leaked by the anti-secrecy group WikiLeaks. Details of Cambodia’s sudden U-turn, and the worriedbackroom consultations among the US Embassy, United Nations and Cambodian officials that preceded it, are contained in a series of diplomatic cables published by WikiLeaks this month. The classified documents highlight how the United States and the UN Refugee Agency, UNHCR, were caught flat-footed in countering China’s influence in the lead-up to the controversial December 2009 deportation. And, say human rights observers, the cables cast a troubling spotlight on China’s ability to export its human rights agenda to developing countries like Cambodia. The first Uighur asylum seeker to arrive in Cambodia came in May 2009. Another 21 Uighurs arrived in October and November. Members of the group, which included two children, fled China following clashes between security forces and demonstrators in July that year in Urumqi, the capital of China’s Xinjiang Uighur Autonomous Region. Media reports suggest some of the Uighurs had witnessed the violence and feared prosecution if they were to be returned to China. 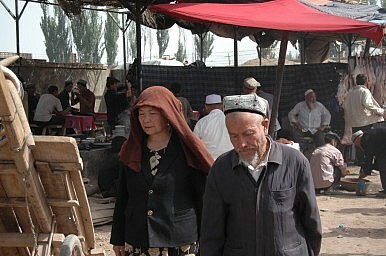 At first, the Uighurs maintained a low profile. But a December 3 report in The Washington Post publicized their presence in Cambodia. The ensuing media coverage, and the pending visit of a senior delegation from China, including Vice President Xi Jinping, alarmed officials at the US Embassy, the cables show. Worries over China’s potential influence on the situation clouded a December 14 meeting between US Ambassador Carol Rodley and UNHCR officials, according to one leaked document. ‘The Ambassador urged immediate action on the Uighur cases…given the large official Chinese presence in Cambodia, the strong ties between the (Cambodian government) and government of China and the wide latitude for operation of Chinese agents in Cambodia,’ a cable dated the same day stated. The cable suggests Cambodian officials, too, acknowledged some degree of pressure coming from Beijing. Giuseppe de Vincentis, then the UNHCR’s deputy regional representative in Thailand, reported that Cambodian Deputy Prime Minister Sar Kheng told him his government was in a ‘difficult position due to pressure from outside forces’ — a reference Rodley interpreted as being China. Still, in her own meeting with Sar Kheng, Rodley reported being told that Phnom Penh would protect the Uighur asylum seekers, and that preparations to conduct interviews to assess their refugee claims were underway, according to a December 17 cable. But fears for the Uighurs’ safety proved valid. On the same day Rodley met with Sar Kheng, Cambodian authorities were already preparing to deport the Uighurs, the leaked cables suggest. A long-standing agreement between the UNHCR and Cambodia meant that decisions on determining the refugee status of asylum seekers in Cambodia were jointly held by both parties. But a new sub-decree signed December 17, when the UNHCR was still attempting to arrange translators just to interview the Uighurs, assigned total control over status determinations to Cambodia. On what appears to be the same day that Sar Kheng assured Rodley the Uighurs would be given due process, Cambodia instead authorized their deportation. Increasing Chinese political influence and presence in Cambodia has sparked anti-Chinese sentiment. How China Came to Dominate CambodiaLaw Not War in the South China SeaObama’s Vital Asia Trade MissionSouth China Sea Is No Black SeaWhat Will It Take for Cambodia to Actually Strike Oil and Gas?